The Best Camping Trip Yet! 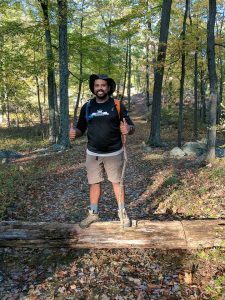 Louie has been a CHRC member for two years, and give us this report of “the best camping trip” yet! After a popular and successful spring 2017 camping trip, Sunny organized yet another camping trip in the fall. The group was smaller, but still cool, and we decided to go camping in Harriman State Park, NY, about a 1.5 hour drive from Crown Heights. We were all set to meet at Sunny’s place early Saturday morning, October 14th, and head out but it was a delayed start for us. The Brooklyn Rock ‘n’ Roll Half Marathon was happening and roads were temporarily closed. We would’ve gotten away with camping, if it weren’t for the meddling runners! While waiting for the runners to pass, we packed a trowel and toilet paper. We ran across Berlin and Chicago marathon finisher Akil, who was training for the NYC Marathon. Convincing him to run a fourth marathon, the Philadelphia Marathon, wasn’t working, so we decided to let Akil finish his run. After the last few RnR runners passed, we got into Shelley’s car and began our outer-Brooklyn adventure! Heading up north, we passed the Manhattan Bridge (part of the new NYC Half course), The High Bridge (more bridge than park), and the Tappan Zee Bridge (I think? Someone fact check this!). Shelley found a Stop & Shop on Route 202 to purchase food and water. This is when we encountered our first [world] problem for the weekend: what kind of chips should we get? After we resolved our food problem, we continued driving into the park region following 3 Porsches on part of their lunch trek to Goshen, NY. Unable to pass ourselves off as Porsche owners, we eventually veered off and found the parking lot to the start of the trail head. Our first trip had no slips and we engaged our quads on the incline up Tom Jones Mountain. The foliage was vividly colored in red and green! Although we did see a sign for a shelter (H/T Spencer), we did not see the lean-to, which was also marked on our maps. We found a different spot to set up camp, then returned to the car to get the remaining gear and food. Each one of us slipped gracefully on the second trip. With our bellies full, we were ready for a hike. We decided to go counterclockwise in the shape of South America. It was a rough decline and we knew we had to go back up at the end. But we came across an intersection: the trail was marked with a “V”, but the map showed it was a blue trail. After closer review, we discovered that “V” was for Victory, which would be the final trail of our hike. We continued on the red trail until we reached Parker Cabin Mountain, which had yellow triangle trail markers. We passed hikers going up the yellow trail who warned us to “be careful going back up”. The yellow trail was steep and technical! We were relieved we were not returning back. Instead, we were heading to the blue Victory trail. We ate huge portions of dinner and no dessert. The starry night sky was clear and we exchanged deep, dark secrets around the campfire that we would all take to the grave. It was time for clean up, then off to bed. We woke up the next morning contemplating cooking a hearty egg breakfast or tasting the local flavor at the Mount Ivy All American Diner on Route 202. Trying to avoid further trips and slips to the car, we packed it all up in one trip and headed to the diner! Most of the diner tables had jukeboxes, except ours. But it was here that we learned which of us had a fondness for ketchup! We ended our dining experience with scratch-off lottery cards, which is apparently a tradition, and drove back to Crown Heights. 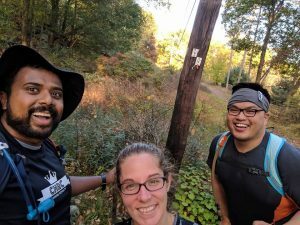 While the trail markers in Harriman State Park definitely needed a new coat of paint, you can’t beat a getaway from NYC with some wonderful runners not running!